With over 120,000 miles of coastline, eight forest regions and impressive national parks in every province / territory from the Rocky Mountains to the Atlantic Coast, camping is one of the best ways to enjoy this beautiful country. Like many industries, the sector was hit by the global recession but some campground owners in the neighbouring US consider it a recession proof industry. With the help of the government, leaders in the industry and initiatives such as learn to camp in Ontario, public engagement is on the up and camping is making a comeback. Another demographic getting back into the camping spirit are the ‘empty nesters’, who camped with their families and are nostalgic. However, they ‘don’t necessarily want to sleep on the ground anymore’ and are seeking alternatives according to Craig. Parks Canada’s director of visitor experience, Ed Jager believes that ‘the Canadian population is increasingly urban and diverse, so there are fewer people who have had a childhood experience of camping’. However, trends in the sector mean that camping is evolving to suit everyone’s tastes - from the city-dwelling urbanite to the wilderness explorer. There are a variety of camping styles in Canada to choose from. Backcountry camping is one for the intrepid explorer, practiced in the wilderness away from the hustle and bustle of the traditional campsite. In order to get to these backcountry sites, campers will often have to hike, canoe or snowshoe their way to their final camping destination. Frontcountry camping, more commonly known as ‘car camping’, is the most popular kind of camping in Canada. Frontcountry campgrounds usually allow campers to drive their car into the site and pitch up on the spot. 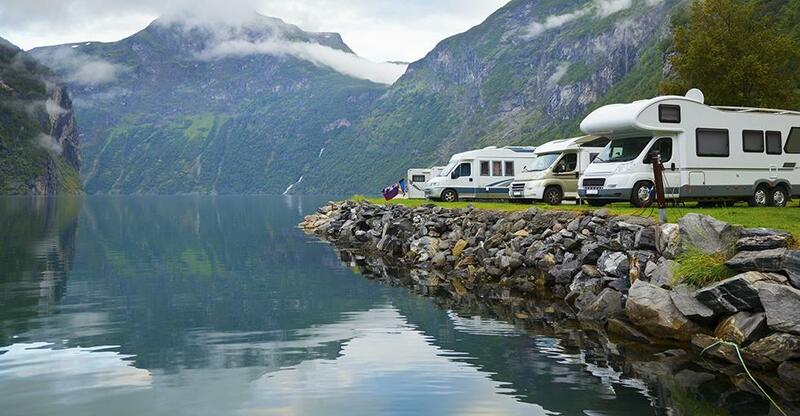 Serviced – Often with electricity, water hook-ups and sewage facilities, these campgrounds offer a number of amenities for tents, trailers and recreational vehicles (RVs). Some of these campsites also have pre-pitched tents, log cabins, restaurants, shops and swimming pools. Unserviced – The preferred option for tent campers, these campsites don’t usually offer electricity, water or sewage hook-ups directly at the site. Instead amenities such as washing up bays, WC facilities and drinking water taps are close by. The way in which Canadians camp has changed and whilst traditional camping is still a popular option, more and more people are seeking out the home comforts of a bed and that all important Wi-Fi connection. Glamping, the portmanteau of glamorous and camping, has swept the country. Fuelling an entire industry, it has been a key factor in the number of Canadians staying in the country for their vacations (aptly named ‘staycations’). Luxury bell tents – Often with king or queen sized beds, some campsites kit them out with underfloor heating, furniture and a Wi-Fi connection. Teepees – Teepees have become one of the most popular glamping options; often heated through wood burners, this traditional dwelling can be one of the cosiest. Yurts – Yurts are quickly becoming a Canadian favourite. Boasting a spacious circular shape and all the conveniences of a home from home, they often have a full kitchen, bathroom and bedroom. Tree spheres – Perhaps the most creative and unconventional camping option we’ve heard of, these suspended spherical treehouses allow glampers to sleep suspended on ropes and swaying in the breeze. Canadas mountains, lakes, forests and rivers offer campers plenty of opportunity to indulge in some of the best outdoor pursuits. Many campsites are partnered with a local outdoor activities company (offering discounts for their customers) or have their own hire services. Coast / river / lakes - If the campsite has a lake or is on the coast, naturally the campsite should take advantage of this. Some of their options include: canoeing, paddle boarding, white water rafting and whale watching. Mountains / forest – Hiking is a popular pastime and some campsites offer group excursions. Activities like fishing and shooting, bike riding and horseback riding are also popular along with skiing and snowboarding in the colder seasons. As the joys of camping become more attractive to a widening demographic, fuelled by the rising popularity of staycations and glamping, there’s never been a better time to invest in a camping business and make the most of what the great outdoors has to offer.